….. and you should relish it as an important part of your holiday. We want you to be able to get to Nanyuki by public transport and there are several options which might suit you. request the train to stop at Duirinish station, about 3 miles before Kyle, and simply walk the last 500 metres to Nanyuki! 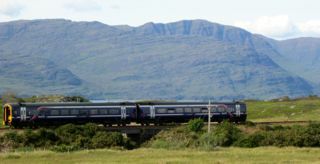 it may also be possible to fly to Inverness from Birmingham, Exeter, Newquay, Norwich and Southampton but note these flights may not necessarily connect with the last train or bus to Kyle of Lochalsh and might be more expensive. Another leisurely option would be an extra nights stay in Inverness and catch the train the following morning. Drumbuie is reached by a four hour drive north from Glasgow. 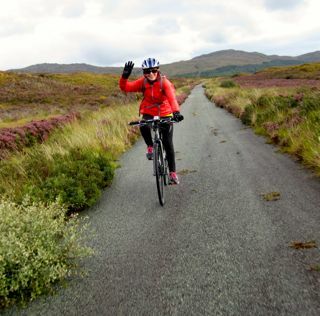 The journey will take you up the banks of Loch Lomond, through Glen Coe and north from Fort William through the Great Glen and past Eilean Donan castle. The route is picturesque but busy in summer and can be frustrating at peak times. … but if you are going to come by car you may wish to put your own bikes on the carrier… but do consider Nanyuki for your accommodation requirements. and experience cycling along some spectacular roads and tracks when you get there. and with any questions you may have. We are currently taking bookings for Spring and Summer 2017 onwards.